Personally generated over three million dollars in sales while leading a sales team of 12, and overseeing 5 stores with multi million dollar annual budget to success in attaining sales goals. Assures competent administrative management, exceptional customer service, and a training focus on product knowledge and consultative selling to meet client needs and accomplish sales objectives. üRanked #1 in 2 key sales indicators including highest profit add-on and highest average ticket market-wide in 2010. At Mid-Year 2010 Ranked #1 overall in market Primary Sales Ranking, and Ranked #2 overall in Secondary Sales Performance Ranking. üRanked #2 Area Manager Overall - Central Region 2009 based on area team performance including ticket average, gross margin, index to LY, budget %, and conversion by providing leadership and motivation for Area Sales Team. üRanked #2 Overall in Sales for Cincinnati Market 3rd Quarter 2009 with top Ticket Average and top Budget % of 109.2% and Ranked #3 in Sales Volume. Turned-around restaurant with healthy six figure budget while managing a team of 28.Increased profitability and level of customer service through team building, training and motivation. Improved controls on profit and loss and created a culture dedicated to achieving excellence to become a market leader in Speed of Service in 2004. 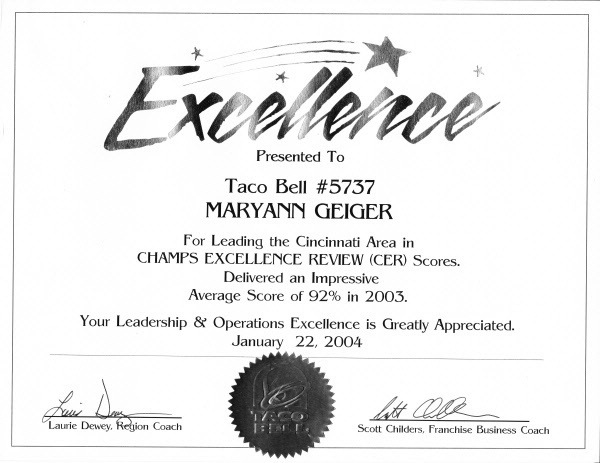 Recognized for leading restaurant team to acheive #1 ranking in Cincinnati Area for Top Overall Performance with Overall score of 92%, and #1 ranking in Hospitality with score of 98.5% in 2003. Utilized excellent negotiation skills to "sell" claims settlements to insured clients and claimants. Achieved 100% settlement of all assigned claims by utilizing exceptional persuasive and negotiating skills, and earned recognition for helping to settle 100% of all claims for the Total Loss unit team that had past initial target dates for settlement, including several claims pending settlement for extended periods. Managed an assigned sales territory in business to business sales environment. Prospected clientele and gained appointments with decision makers to present office imaging solutions customized to client needs. Accomplished being the first and only salesperson of my tenure at the Houston office to close a deal over $50,000. Provided technical and scientific expertise in archaeological field survey, testing and excavation at archaeological sites in Texas and Louisianna. Discovered and documented deposits and curated artifacts from historical and prehistoric sites. Worked as part of archaeological teams, and entrusted with orienteering to ensure archaeological survey teams did not deviate from accurate transect during field surveys, and with creating archaeological record for teams due to attention to detail and accuracy of documentation. Provided scientific and technical expertise in archaeological field survey, testing, excavation, and laboratory work. Recognized for accuracy and detail in documenting the archaeological record. Promoted from position of Archaeological Field and Laboratory Technician to Crew Chief for exemplary record of accuracy and team leadership. Supervised and provided leadership, organization and technical expertise for a team of archaeological field technicians. Entrusted with orienteering for team, and recognized for accuracy in documenting the archaeological record, and for composure in challenging environments. Selected by supervisor to work with her as a member of a two-person team that researched and discovered the location of a historic Civil War road in Lake Jackson, Texas from inception of a scholarly question, to mapping of the discovery using a creative combination of historical research, aerial photography, and archaeological field investigation. Excelled as business to business sales representative for manufacturer of high quality stainless steel fasteners, cutting tools and other industrial mainteneance tools. Presented product demonstrations and sales presentations to large departmental groups, management teams, and corporate buyers. Prospected and established major accounts including Anheiser Busg, Waukesha Pearce Industries, the City of Houston, and the University of Houston. Clients included large industrial plants including the Bayer Corporation, U.S. Gypsom, the Dover Elevator Company, the Coca Cola Bottling Company, Sysco, Air Liquide, numerous hospitals, chemical plants, food processing plants, and shipping facilities in Houston. Exceeded sales goals, provided exceptional customer service, and lead training initiatives in Better Sportswear Department. Worked intensively with clients to acheive sales goals and generate traffic. Recognized for providing exceptional customer service. Recognized for creating and maintaining a highly detailed clientele book to drive traffic and to customize client experience - Clientelle Book was used as example in store-wide meetings to train other sales associates on the use of the tool. Top producing NAPSR Certified Sales Representative with impressive 15+ year career in sales, including outside sales and management. Strong communicator with Bachelor’s Degree in science field. Strengths in problem solving and aggressively exceeding sales budgets to grow market share by offering customer-focused solutions. üSales:Results driven, consistently ranks in top 10-20% in all sales indicators using a consultative selling approach. Recognized for winning regional sales contests including: First Place in 4th of July Sales Contest with 141.31% to budget 2011; Ranked #1 in Memorial Day Sales Contest at 104% to budget 2011. 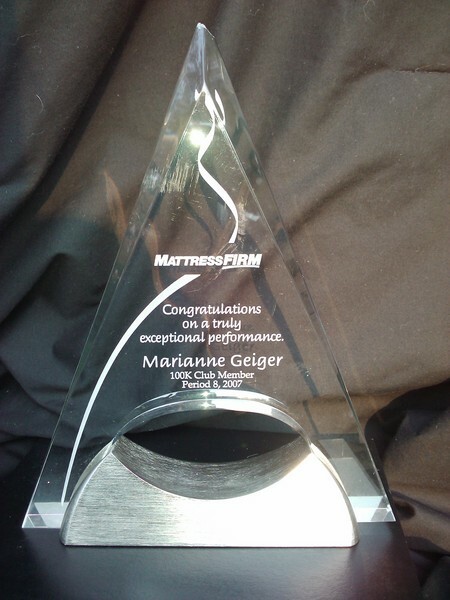 Received “$100,000 Club” award for period sales at Mattress Firm 2008.
üSales Management: Selected for promotion to Area Sales Manager for professionalism, leadership and performance 2008, lead Area Sales Team to rank #2 overall in region, 2009 at Mattress Firm. Skilled team leader and manager: managed team ranked #1 in Cincinnati Area for top overall performance of 92% and #1 in Hospitality with score of 98.5% at R.G.T. Management, Inc., 2003. Increased departmental sales 32% through sales team motivation, training and development, organization, and merchandising a Foley’s Dept. 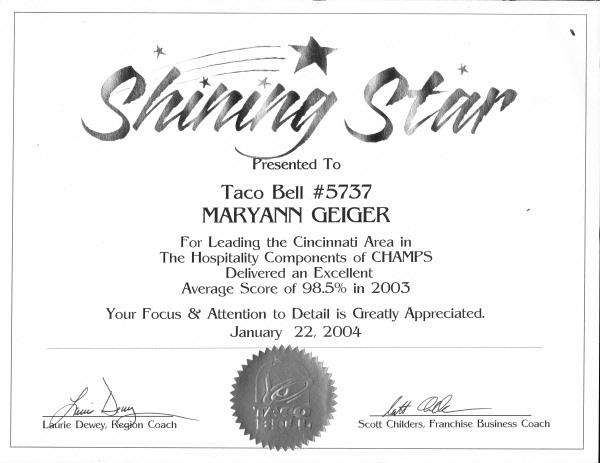 Store 1999.
üCustomer Service: Lead the region in referred sales in 2010 by forming strong client relationships and offering creative solutions to meet client needs. Excels at listening and negotiating to resolve 100% of the most challenging customer service issues for district at Mattress Firm. Resolved customer issues as manager on “At Your Service Team” for 300+ sales associates at Foley’s Dept. Store 1999.
üBusiness Development: Received award for greatest number of sales in a month as Sales Representative with Premier Industrial Corp., 1996. Opened 5 new stores, exceeding sales and ticket average goals through creative marketing and networking strategies at Mattress Firm. A sales position in which my consultative sales and management skills will positively impact market share and profitability through customer-focused problem solving, and creation of an exceptional customer experience. Top producing sales representative expert at establishing and cultivating relationships, building rapport, listening and qualifying to determine needs, to offer meaningful solutions to customer problems. Consistently receives recognition for exceeding budgets, winning sales contests and leading sales of profitable add on sales, gross margin, ticket average.